In addition to the peace and tranquility of Pond Keeping, spending time with your Koi can be equally rewarding.Koi are very sociable and love a crowd of friends. They are less apt to be shy when they are in a large group. Gradually, the Koi will equate you with food. This usually takes about 3 to 5 days.Tease them closer with small sprinklings of food. Put your hands in the water while they eat.The Koi will learn that food comes from your hand. Start with just a few pellets. The bravest Koi will soon be nudging your hand. It is only a matter of time and all of your fish will swimming,jumping and splashing toward you every time you walk by the pond. Taming and training your Koi is a gradual process, but it can be very rewarding. Spending this time with your Koi willalso allow you to observe any problems early on. Many Koi owners do not realize the importance of feeding. 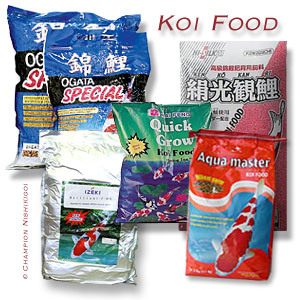 Not only must consideration be given to the amount andtime of feeding, but to the combinations of foods that are essential for healthy and colorful Koi. Less than 50ºF. Do not feed Koi. Temperatures at 50° F. of more than one month may require supplemental feedings of low protein and high carbohydrates. 50-55ºF 2-3 times a week if Koi are hungry. High carbohydrate, low protein, laxative type foods.Wheat germ, Cheerios®, squash, lettuce and brown bread. 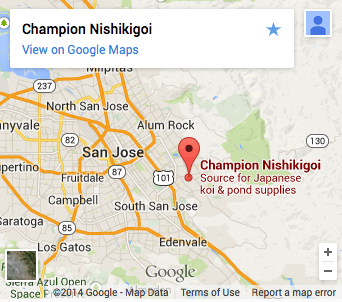 55-59ºF 4-5 times per week if Koi are hungry. Add low protein (25%) pellets along with vegetables. Increase quantities gradually as temperature increases. 59ºF Once per day six days per week. Low protein (25%) pellets along with high carbohydrate vegetables and fruit. 60-65ºF Once per day every day. Gradually increase protein in pellets (35%) and quantity of pellets. Vary diet with vegetables and fruit. 65-72ºF Once or twice per day. Bulk of diet should be 35% protein pellets. Add fruits, vegetables, and plankton for variety. 72-80ºF 3 to 4 times per day. High protein pellets (35% to 40%) with color enhancers. Add plankton, vegetables, fruits, and shrimp.